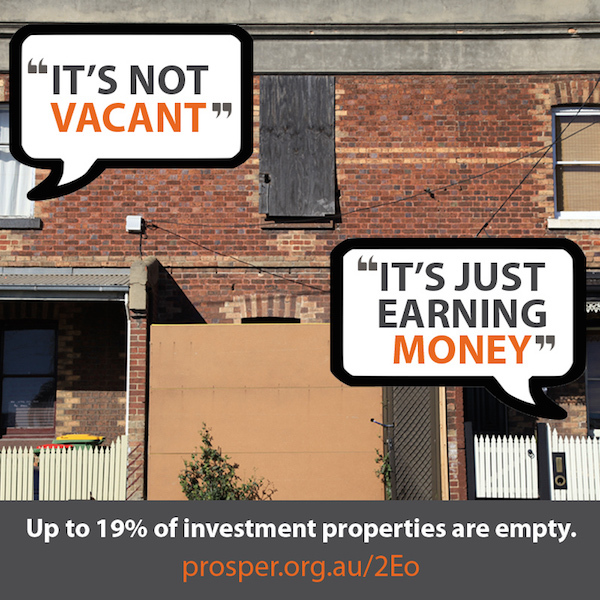 82,724 properties lie vacant and unoccupied across Greater Melbourne, according to Prosper Australia’s 2015 Speculative Vacancies Report released today. The annual Speculative Vacancy Report produced by Prosper Australia investigates real dwelling vacancy rates as opposed to advertised vacancy rates, and shows that housing is one of our least efficiently used resources. Abnormally low water consumption is analysed over 12 months as a proxy for vacancy, determining speculative vacancies. “The incentives for property speculators to hold prime locations empty is an affront to anyone locked out of housing. The findings prove we do not have a housing supply crisis, we are literally locked out” said Karl Fitzgerald, Prosper Australia’s Project Director.